Two newly developed print heads are configured in a staggered pattern, which allows the end-users to quickly respond with increased speeds for wide-format soft signage with a productive high-speed print speed of 32.0 sqm/h in 4 color mode*1. Improved ink jetting angle achieves higher print image quality without grainy appearance in 4-color mode by jetting variable size dots, Large, Medium and Small variable dots, with a maximum resolution of 1440dpi. UISS*2 is standard equipment - Two ink cartridge holders are allocated for each color. When one ink cartridge indicates low ink level, this system automatically switches to the other one. Additionally, using in combination with the MBIS*3 that supplies ink from aluminum ink packs(2L) extends the time of ink supply and reduces not only ink cost but also environmental footprint. 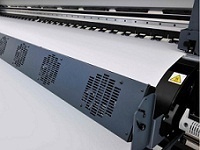 To further improve work efficiency, an automatic drying fan*4 is offered to shorten the ink dry time and allows for continuous media take-up during high-speed printing. *4：Automatic drying fan is the option.